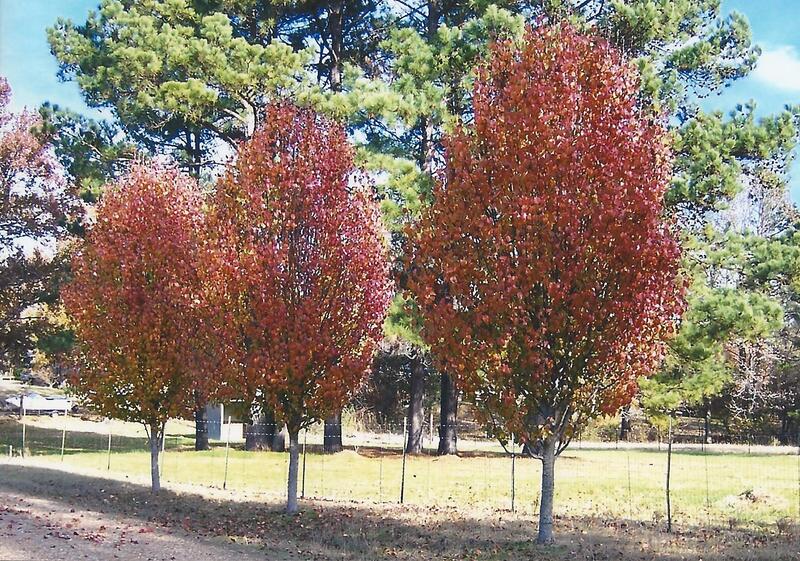 As time moves on, our individual seasons or stages of life pass and change–sometimes slowly, sometimes quickly. Regardless of the speed or whether we are currently where we want to be, it’s a lot easier to navigate if we are open and receptive to the continual ebb and flow of life. If we hold too tightly to where we are and resist change, our hands will not be open to receive the new gifts before us, and we may find ourselves forcefully swept off our feet. On the other hand, if we wish away each day until a “better” season comes, we’ll miss out on the beauty and wonder of the here and now and that wonderful feeling that comes with knowing (regardless of the “bad” times) and accepting that you are where you are supposed to be. You know, even if you are going through a difficult or uncomfortable time in your life, you can’t let it fill the entire window of your view on the rest of the world. You’d be better off, perhaps even happier, seeing it as simply one of the many panes to view your life and the world through. Whether you realize it or not, there is so much more going on around you and inside you: growth, change, learning opportunities, loving moments, blessings. If you make an effort to adapt your focus, you will begin to think about things that may not be readily visible … things that really matter. 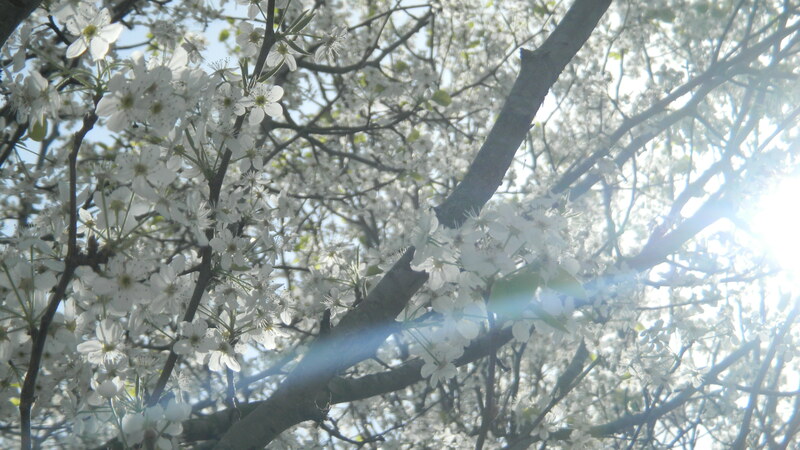 When you look at your life, what do you see? I found these words from Lysa TerKeurst: “Do I see the incredible spouse I married, or do I just grumble about his faults? Do I see the health of a son who can play sports as a good thing, or do I just grumble about his sweaty laundry? Do I see how fortunate we are to have enough food to eat, or do I just grumble about a kitchen that never stays clean?” Think about it. What do you see? It sort of reminds me of conversations I have had with friends about my job as a coypeditor. Overall, the evidence of my work is not visible to most people because they don’t see the mistakes that were caught and fixed. However, if I’m not doing my job or I do it poorly, people notice; some might even be quick to point out the mistakes. Similarly, some people tend to focus more on what is wrong in their lives than what is right. Do you ever think about all the good things God is doing for you every single day? Things that you don’t even notice? I imagine the good things that go on in our lives because of Him are not noticed nearly as much as the things we determine are wrong or inconvenient or “shouldn’t have happened.” And we sure seem to pray or talk to Him about all the things we wish he would take away or fix more than we thank Him for all the good He has done. I know I am guilty of that. For example, sometimes when I’m driving, my mind goes elsewhere. Suddenly, I find myself at my destination with no real recollection of the drive. (I do pay attention most of the time. Really.) Have you ever thought about how many wrecks you didn’t have because God was watching over you? Do you thank God every day that you can get up in the morning and you can breathe easily and walk steadily and you aren’t in pain? If you’re like me, I think we tend to take stuff like that for granted, until we experience the opposite. After suffering whiplash from an accident and dealing with some other issues, my sister Elizabeth commented on a Facebook post recently: “so today was totally opposite from yesterday and was a very bad day mostly. woke up in severe pain, baby is teething and in tons of pain, lost all my contacts in my phone, power went out, etc. But like I told my brother, today has made me realize how many wonderful days I have and how very very few bad ones. I love my life even when it is a bad day :)” She’s got the right idea. Thankfulness and prayer can help turn your inner turmoil into peace. Peace about who you are, where you are, and what is going on in your life, no matter what the season. And with that peace comes hope. So, if you haven’t already, take a moment now to be grateful for who you are, who is in your life, what you have as well as what you don’t have … and be sure to truly experience and learn from the here and now of this season in your life. It will be gone before you know it. But you won’t need to look back with regrets; there will be a new day to live right in front of you. I’ve got an easy “seasonal” recipe to share with you. 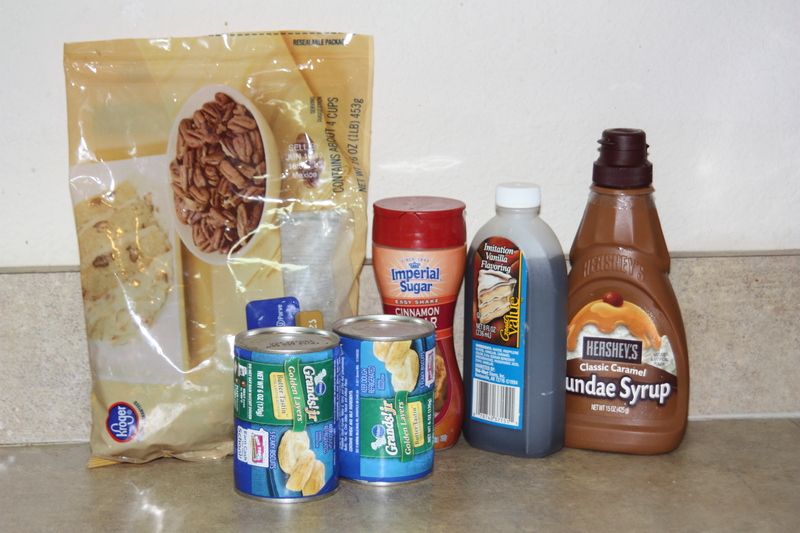 Next, I got my selection of toppings together. 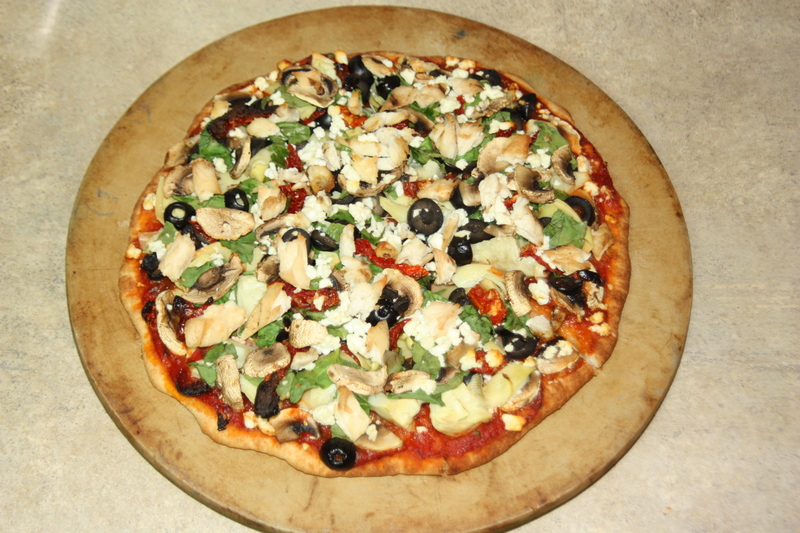 I was going for a Greek pizza, so I chose Prego Veggie Smart sauce, grilled chicken breast strips, black olives, spinach leaves, artichokes, sundried tomatoes, mushrooms, and feta cheese. Here is where you can mix things up by selecting seasonal veggies and/or adding in your own personal favorites. I would have made it without the chicken, but I added the meat for Bart. I layered all the ingredients and baked on 350 for about 8 to 12 minutes. 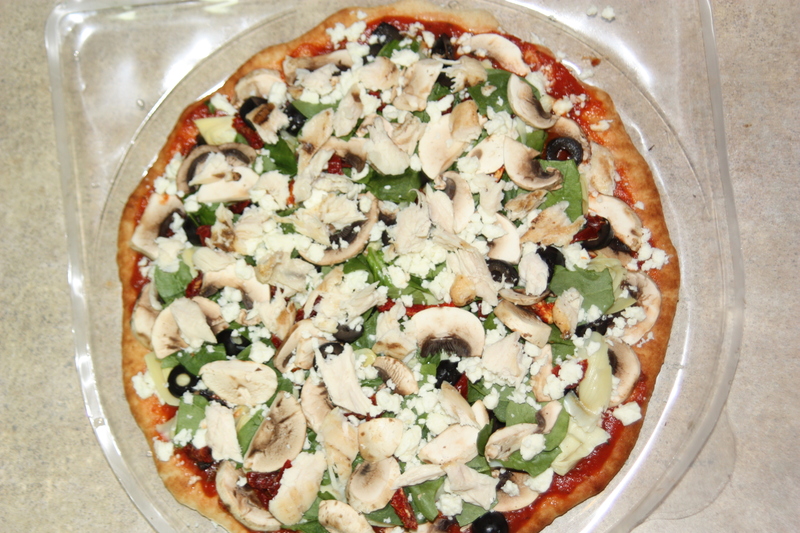 If you choose a crust that needs to be baked, you’ll need to follow the directions on the package before adding your toppings and popping it back in the oven. 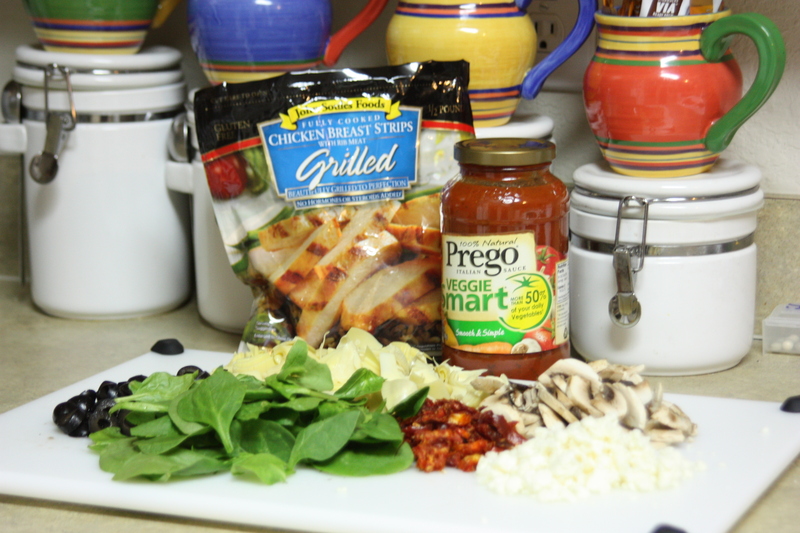 The only part of this recipe that takes a little time is chopping your toppings. Other than that, this is a quick and easy meal and could turn out to be a fun/creative event for the family. Enjoy your time together and your fabulous pizza! To those who follow my blog, I apologize for not posting anything for about three weeks. I was enjoying family time with my stepson who was in town visiting us, and then I had to get caught up on work. Thank you to Angela who checked up on me and requested a new post. 🙂 It’s always nice to hear you are missed. Today is the first Monday of my new adventure as a stay-at-home copyeditor/writer (Friday was actually my first day “on the job”). My favorite part so far — not having to get up at 6:30 with the alarm. I can sleep until I’m ready to wake up, which so far has been around 8:30. Such a wonderful perk! Other benefits? I get to spread my work out over the day — working a couple hours at a time and then “breaking” to go wash some dishes or throw a load of laundry in the washer or dryer or run up to the store. It’s a pace much more conducive to creativity, and it allows me to make sure that I am at my best when focus and diligence are required (which is all the time with editing). Working from home will also allow me to be more flexible about fitting in a daily devotional time, exercise, craft time, and time off with my husband, and it gives me more time to monkey around in the kitchen trying new recipes that I can then share with you! 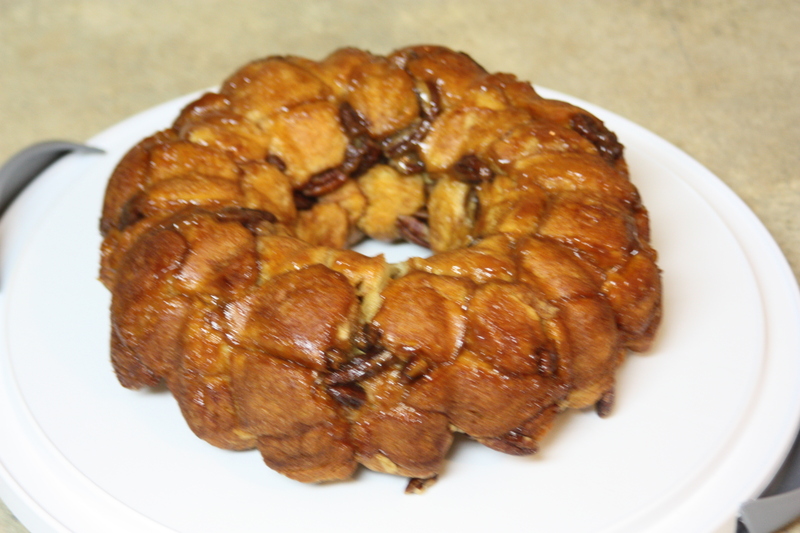 In honor of this sweet benefit, the recipe I decided to try this past weekend was Healthified Monkey Bread from EatBetterAmerica.com. It was so easy to make and soooo delicious! I will definitely be making this again. 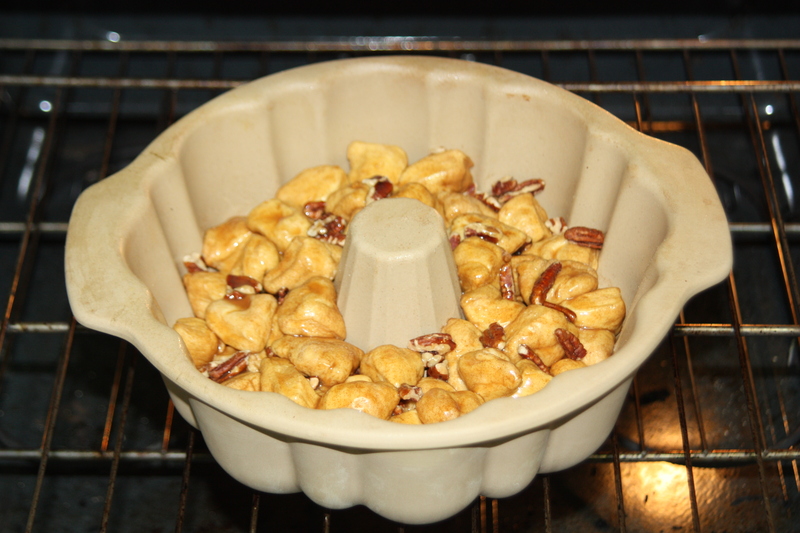 The ingredients: sugar/cinnamon, refrigerated biscuits, chopped pecans or walnuts, caramel topping, and vanilla. That’s it. You can click on the blue link above for the recipe specifics, but I think once you make it one time, you won’t even need to measure the ingredients; you’ll be able to simply throw it all together and still create a masterpiece. Notice that I used a pre-mixed cinnamon sugar combo, and I didn’t use fat-free ingredients as listed in the recipe. I will probably try the fat-free next time; I simply used what I already had on hand. You can decide for yourself which you prefer. 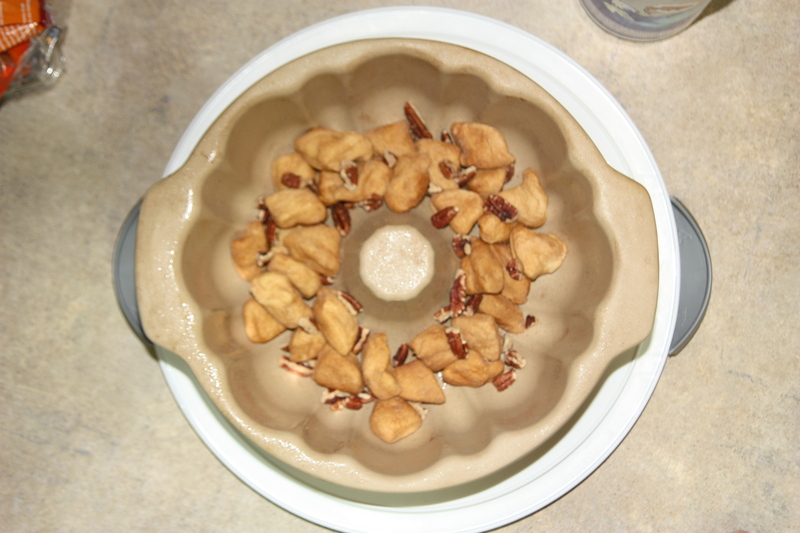 Once biscuit pieces are coated, begin to layer them with pecan (or walnut) pieces in a bundt or fluted tube cake pan. I used a stone Pampered Chef pan. When layering is complete, mix caramel topping with vanilla. Since my caramel sauce had been in the fridge, I took the lid off and microwaved it for about 20 seconds first. Then, I poured it into a small bowl with the vanilla. 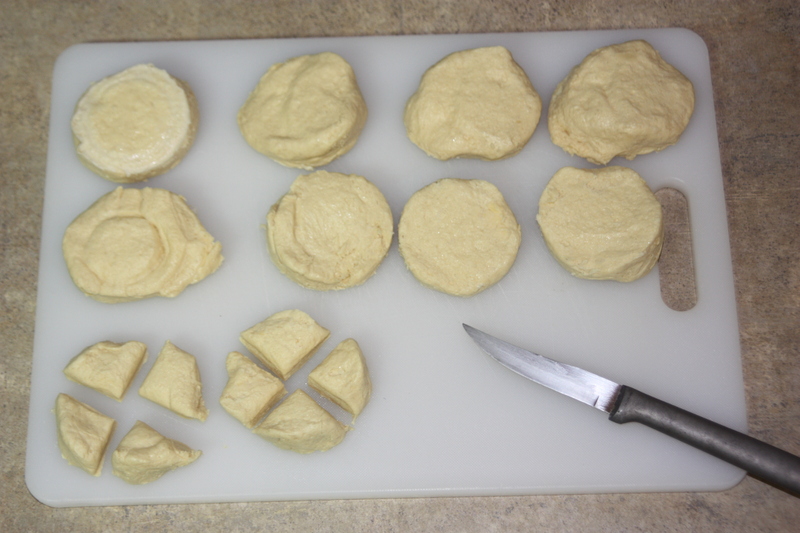 After mixing, I drizzled it over the biscuit pieces. 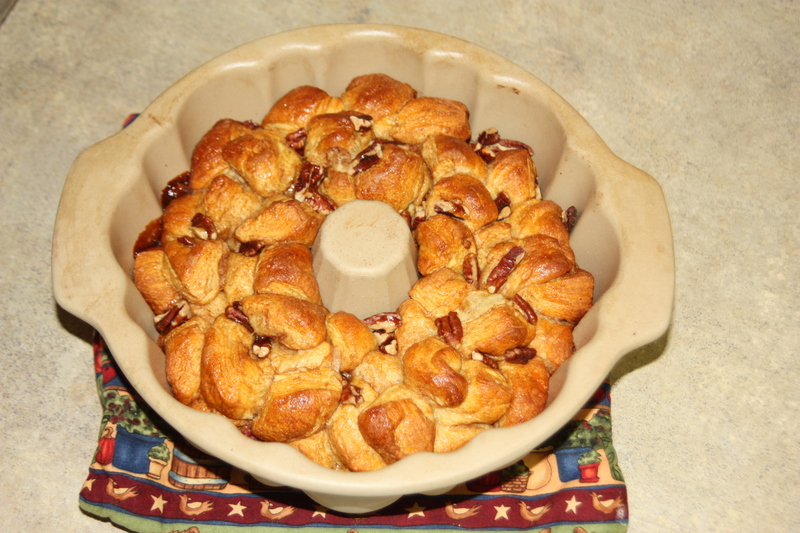 With this pan, and my oven, it only took about 30 minutes rather than the 40 – 45 suggested in the recipe. I recommend checking it early. We took this over to my sister-in-law’s house to share and it was a hit. To those of you whom I used to work with — I’m thinking about making this for you when I come to visit sometime. Meanwhile, don’t be afraid to try the recipe yourself. Even if you are not a regular baker, you CAN do this. Enjoyed a pretty low-key three-day weekend. Did a lot of pinning on Pinterest. Watched a few episodes of NCIS.Took a couple naps. It was nice to NOT be super busy for a change. The only work I did do was something for my husband Bart. Because he works retail (Mattress Firm), instead of having time off for the holidays, he and his team members always work extra hours. So, we have made it a bit of a tradition now for me to deliver food to everyone at the stores he manages as a bit of a moral booster and thank-you. Usually that’s four stores. Well, this year we decided to go a bit bigger with all of the new people recently brought on board through Mattress Firm’s purchase of Mattress Giant. Over the last two days, I delivered meatballs to almost all of the stores in his district – that was 17 stores. Now that’s a lot of meatballs. Luckily, I use a super simple recipe that is easy to prepare, and I’m told by some that it’s better than their Mom’s meatballs. High praise. 🙂 To keep my post for the week simple as well, I’m going to give you my recipe. I believe the bags come with about 48 meatballs; I serve 12 per person, so that makes 4 servings. (Increase the ingredients above as needed for more servings.) Sometimes if I am doubling the recipe, I choose cranberry sauce for the second can – it seems to create more sauce. Pour meatballs into crock pot. 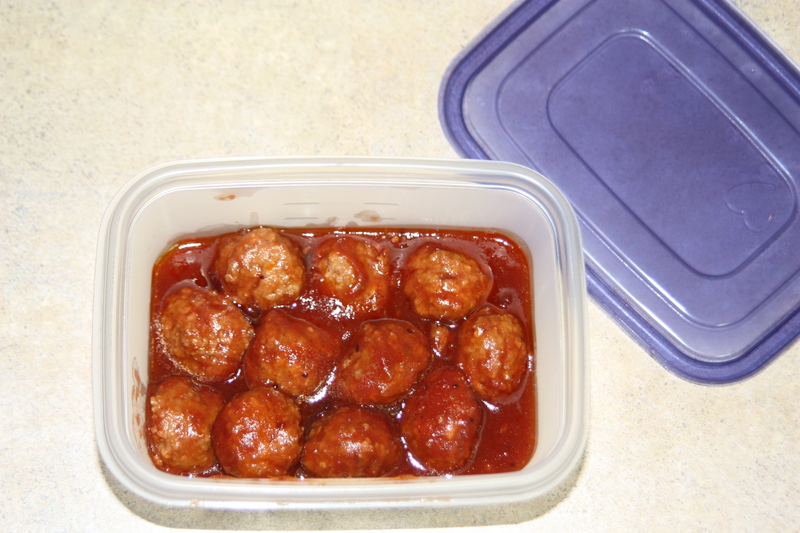 Pour in chili sauce and stir to coat all of the meatballs. If I’m going to be home all day, I’ll put it on low and stir occasionally to heat all of the meatballs all the way through and keep them simmering in sauce until we’re ready to eat. If I need them done more quickly, I usually turn them on high for a couple of hours. And that’s it! Makes a great appetizer or meal. Can be served as is (maybe add a little Parmesan) or add to rolls for meatball subs. Yum! 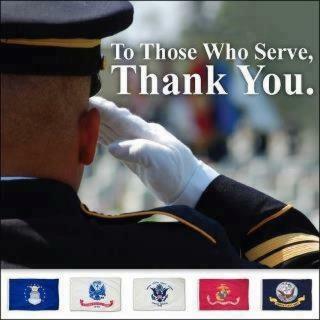 Hope you enjoyed your Memorial Day weekend and paid tribute to those who have served and still serve our country.